I’m so glad I listened to this book in the car instead of reading it in print because I can’t imagine the havoc it would have wreaked on my TBR list if I could have made notes as I read! 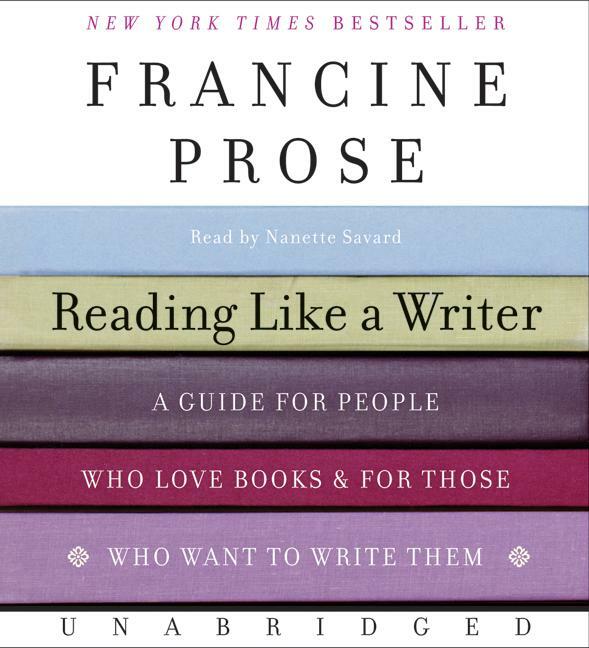 In this book, author Francine Prose discusses the finer points of fiction writing, starting with words, continuing to sentences and paragraphs and proceeding through dialogue, details, gesture, character and more. Throughout the book, she shares passages from such great writers as O’Connor, Austen, Tolstoy, Kafka, Chekhov, Woolf, and Roth. She explains what makes these passages work and what aspiring writers could learn from the masters. Although this book does contain some guidance for writers, it’s not really a “how-to” book. I have no aspirations to write fiction, but I do want to read more attentively, and this book offered some examples and guidance for doing just that. It did precisely what I was hoping for. One of the things Prose advocates is close reading, paying attention to each word, always with the knowledge that the writer chose these words with care. I was somewhat skeptical about some of her ideas here, mostly because she doesn’t mention the role of the editor, and in my own editing work, I end up choosing a lot of the words. This naturally makes me wonder how careful writers are about their word choice. What I forgot, however, is that my particular niche of the editing world involves working not with writers interested in crafting exquisite language but with authors who have important ideas to communicate. Don’t get me wrong, some of the authors I’ve worked with are excellent wordsmiths, but they are not all writers. My job is to ensure that their ideas get communicated. Prose, however, is talking about writers as artists, which is another thing altogether. So I ended up on Prose’s wavelength to some extent—but with the caveat that even literary writers vary in the attention they pay to individual words, sentences, paragraphs, and so on. I’m still not convinced every author is as consistently deliberate as Prose claims. Nor are the deliberate ones always successful in their choices. Listening to this book did challenge me to pay more attention as I’m reading for pleasure, especially when I can tell that an author is playing with language and motif and other elements that might pass me by if I were to focus entirely on character, plot, and theme. Inspired partly by this book, but also by Emily’s comment on Eva’s post about noting key passages in books, I read Godric by Frederick Buechner with a pen in my hand this week. This put me in a mind-set in which I paid attention to words and recurring motifs in a way I usually don’t. With a certain kind of book, I can see this being a rewarding way to read. I’m not sure it’s suitable for every book, but I can see the value, especially on a reread. I also generally agreed with Prose’s attitude toward the rules of good writing. She believes writers should understand the basic rules, not just in grammar but also in plotting, character, and so on, but she recognizes that a good writer can break any or all of these rules. She talks extensively, for example, about the value of the paragraph break for resting the eyes. In many cases, what she has to say here is absolutely true, and it’s certainly something writers should keep in mind. However, as I was listening I kept thinking, “but … but … Jose Saramago! The man whose hard return key appeared to be broken!” And what do you know? She then mentions Saramago as someone who manages to break the rule and make it work. I may disagree with Prose about the relative importance of certain guidelines (cough*StrunkandWhite*cough), but I totally support the way she blends discipline and flexibility. And oh my goodness, the excerpts. Prose shares some absolutely stunning writing. (A list of works referenced are mentioned on the book’s Wikipedia page.) If I’d not been driving, and if I had paper and pen at hand, I’m pretty sure I would have ended up putting fully half on them on my virtual TBR list. Looking down the list now, the only title not already on my list that I’m sure I would have added is The Marquise of O by Heinrich Von Kleist. (It’s about a woman who gets pregnant and puts an ad in the paper asking the father to come forward so she can marry him. Seriously, people! How could I not want to read this!?) And maybe Drinking Coffee Elsewhere by Z. Z. Packer. But in spite of my relief my TBR list hasn’t grown quite exponentially as a result of reading this book, I wish I had a hard copy, because there are a lot of ideas here I’d like to revisit and think over more carefully, and there are a lot of excerpted passages I’d like to reread more closely. Maybe I’ll just end up reading them in the works themselves! I have this book and I dip into it every now and again. 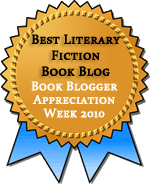 It does really make your TBR explode! This would be a nice one to dip into. Yes, the hard copy does make one’s TBR and wishlist increase exponentially! A wonderful book to dip into occasionally and appreciate prose at word level. I do think the title is a bit deceptive. I’m not sure someone looking to learn to write better would even get much out of it! I think this is going right on the list- I am a writer, but analyzing literature is something I absolutely adore doing. I got a chuckle out of that too. Prose on Prose. Ha! I’m glad to hear that you enjoyed this book. I have it on my tbr pile but for some reason just never seem to get to it. I also agree that certainly not all authors must write with the deliberation and intent that Prose describes… I have read my fair share of books that feel almost scrabbled together, where the language does not dance or sparkle on the page, where the words feel merely like a vehicle for plot. Of course, such writers make the others feel all the more special when we encounter them! Yeah, I think Prose is a little too quick to lionize authors when they’re not all of the same quality! And honestly, I don’t mind workmanlike prose if the story and ideas are interesting. But Prose does suggest some authors who excel in multiple areas, and they are worth knowing about. I love books about books. My best luck has been with Michael Dirda’s, but this also sounds lovely. I may put it on the TBR. I loved Dirda’s Classics for Pleasure, but I’ve never gotten around to his others. He’s great, though, for getting at different levels of enjoyment. Prose is better for reveling in detail, I think, and that’s something I don’t do often enough. This sounds brilliant and something I’d definitely be interested in reading. As an English graduate, I used to read like a writer with pencil in hand but my critical eye has slackened in recent years, and I miss the richness I used to find in the books I read. I agree with you on the point about writers paying close attention to every word they write – I don’t think that’s necessarily the case either – but certainly there is a lot to be gained from thinking closely about the words and structures and devices a writer uses. Great review! I remember dissecting passages in literature classes, and although I had some teachers who dissected passages to death, it can be a fruitful way of reading. Not for every passage and not for every book, but still useful. I’m all over this one. I just checked and my library has this one on the shelves. I’m off to see if I can get my hands on a copy. Hooray! I’m eager to hear what you thought! I love this book! I’m so glad you enjoyed it also! After reading this book, I have added so many books to my TBR list. I think you should get a print copy of this. I’ve found this book to be one I keep going back to, when I want to read about writing. I’m pretty sure I would go back to it if I had a copy on my shelf. I may indeed pick it up if I come across a bargain copy. Hee! I was hoping someone would comment on my Strunk and White reference! For a certain kind of writer I actually think it’s helpful. At age 17, it taught me that long sentences and complex vocabulary do not necessarily equal intelligent writing. And I’ve worked with some inexperienced writers who would benefit from the advice. But so many people use it like a rule book rather than potentially helpful advice to keep in mind. “Omit needless words” becomes omit adjectives, adverbs, auxiliary verbs, and any “that” that isn’t necessary for understanding. Who cares about rhythm and color? I enjoy Strunk and White, and I think for non-artistic writing, they make a lot of good points. It’s like all the rules governing grammar and style–they’re there to be broken, if you can do it well. But doing it well is tricky. This book sounds great! I am a fan of the close reading, even when I am not sure that’s what the writers really meant. I love spotting image clusters and paying attention to layers of meaning in the dialogue. As I said to Litlove, I think S&W is useful for certain kinds of writers and writing, but even in the world of expository writing, where I hang my professional hat, people sometimes overestimate the value of their advice. I just find S&W useful as suggestions to keep in mind, not rules to be followed. I’ve been wanting to read this for a long time. I’m glad to hear it’s THAT GOOD. It is very good. It’s gotten me thinking more about how I read, which is exactly what I wanted. Thanks for this. It was nice to link to your perspective from my review since it was a bit different from mine.